Farming is much more than planting something in the ground and watching it grow or caring for animals. At Mulberry Farms on North Raymond Road in Raymond, sandwiched between Gray and Poland, owners Farmer Frank Pecoraro and his wife Debbie, have a passion for providing good food to the community and educating them on where their food is coming from. “We wanted to provide good food to our family, kids and the whole community. It’s good food you can count on. We’re not as confident in the food distribution as we were in the past,” said Farmer Frank, who has spent most of his life in the food industry. Food at grocery stores is generally chosen because it travels well, and because it travels well it doesn’t taste as good, Farmer Frank explained. Mulberry Farms is an all organic farm, using natural ingredients to enrich the soil and help retain micronutrients and minerals that are native to Maine soil. As stewards of the land, the Pecoraros do everything they can to protect the property by rotating crops and fields when necessary. They use no pesticides and leave fields farrow occasionally. They admit they will never get rich from farming, but for them it’s more than making money, it’s making a difference. “It’s about giving back to the community,” said Farmer Frank, as he is referred to on social media and by everyone he knows. Mulberry Farms has a farm stand on North Raymond Road where they sell their produce and other local products like honey and maple syrup. They have seen women fight over the last cantaloupe in the store, and others return moments after they left to buy another box of berries to actually bring home because they ate the first one they bought. There are U-Pick strawberries, high bush blueberries and raspberries. They grow cucumbers, tomatoes, lettuces, squash and so many more vegetables. This year they officially rolled out a Community Supported Agriculture (CSA) program, where 77 families bought a basket of produce a week for 16 weeks. Farmer Frank describes the program as giving the community a chance to become invested in the farm. When the crops grow well, the CSA baskets contain more food, when the crops don’t do as well the CSA members might not get as much. “They’re sharing in the pain or sharing in the gain of the farm,” said Farmer Frank. The CSA is partly about education. Through a newsletter, the CSA members are educated on everything from fertilizer to crop rotation. “It’s kind of a complete experience,” Farmer Frank said. Fresh vegetables are getting kids hooked on the taste of the food. Whether it’s snap peas or carrots, there will be a vegetable that will be the “gateway vegetable” to the rest of them. The farm sells product to RSU14, Good Life Market in Raymond, Future Foods in Mechanic Falls and Shop & Save in Gray. They also deliver to 10 to 14 summer camps in the area. Only 11 acres of the farm is used to grow produce. Two hundred and forty acres are in a farmland trust meaning that they can never be developed. The Edwards family requested that as part of the purchase. Those from the area remember the property as the Edward’s Farm. Carlton Edwards dedicated many years to the Town of Raymond in public service, said Farmer Frank. Farming isn’t all about the vegetables, but also the paperwork that Farmer Frank and Debbie have to do to earn the organic seal from Maine Organic Farmers and Gardeners Association, and to keep their plantings on schedule. “Today’s farmers are significantly more literate. They’re smarter and clever. You have to be a mini CEO to be a farmer,” said Farmer Frank. The best part is giving back to the community and working with a network of farmers who are very willing to give their knowledge to the new folks on the farm. 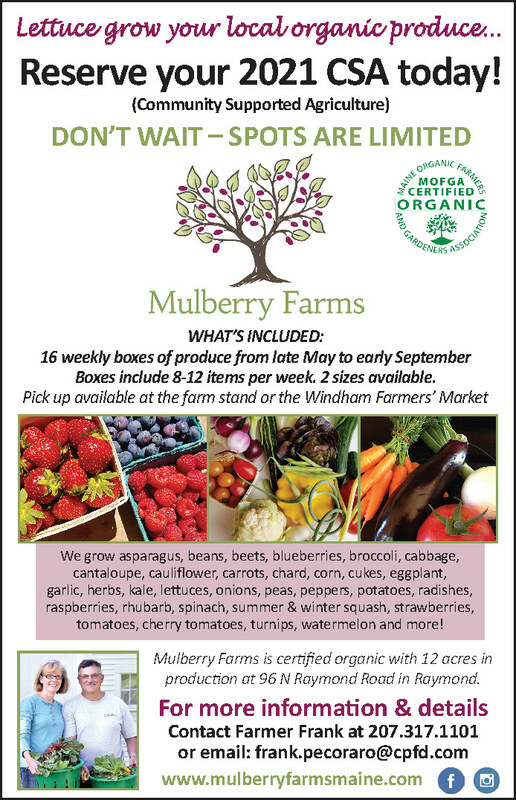 For more about Mulberry Farms, visit www.mulberryfarmsmaine.com/ , find them on Facebook and Instagram or call 207-317-1101. Starting June 15th the farm stand is open seven days a week from 11 a.m. to 6:30 p.m. and on the weekend from 9 a.m. to 3 p.m.